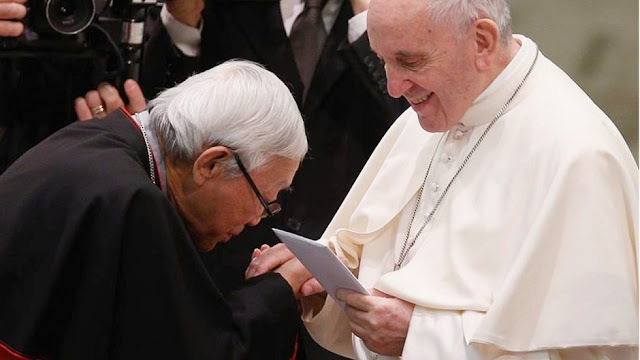 Catholic News World : Cardinal Zen of China writes "A clarification on distinction between Reconciliation and Unification..."
Cardinal Zen of China writes "A clarification on distinction between Reconciliation and Unification..."
The considerations of the bishop emeritus of Hong Kong on claims made by recent articles regarding the agreement between Beijing and the Holy See. I could ignore the “Breaking the trust” by (now) famous Francesco Sisci. I could resist the temptation of answering Fr. Michael Kelly’s (an expert in Church History?) “Cardinal Zen is just wrong.” But how can I ignore Fr. Heyndrickx or abstain from reacting to his pathetic sermon? Actually, I think it would have been convenient to answer both Sisci and Kelly, at least briefly, because I would have answered, at the same time, some main points of Fr. Heyndrickx’s article. I know Sisci. We met a couple of times many years ago. His strong point in life is that he conquered the heart of a girl, who happens to be the daughter of a Chinese General. This allowed him to come and go in the corridors of power in Beijing. But that does not make him a real expert in Chinese matters, even less an expert in Church affairs. As to the central point of his article, co-authored with a certain Strazzari, I have this to say: I plead guilty of breach of confidentiality, but I did it to discharge the Holy Father from responsibility for those evil (wrong?) things perpetrated by his collaborators in his name (they plan to do their dirty job quietly and let us swallow the fait accompli). Yes, I am convinced that the Holy See is not always the Holy Father. Until I see an evil deal signed, I refuse to believe that it can be real. This brings me to my first answer to Fr. Heyndrickx. He is calling everybody to “unite behind the Pope, if …” He has repeated that there is an “if.” He confesses that “we do not know whether the Pope will…” He is only making a prophecy. So I can still challenge him. Only if that unfortunate signing happens, rumored to be on March 23 or 27, I will accept defeat, retire in silence and leave the rostrum to Fr. Heyndrickx to sing his victory. Fr. Kelly went back to the times when Christian monarchs had the decisive power in making bishops. But that is, fortunately,…HISTORY. Now, the present HISTORICAL reality we face in China is: a “pusillus grex” (a tiny flock) being persecuted by a gigantic atheist power. What is happening in China from 1949 until today has no precedent in HISTORY. But why surrender? Doesn’t the Vatican see that many churches (buildings) survive in the underground community e.g. in Hebei and Fujian? Doesn’t the Vatican know that in cities like Shanghai, many priests celebrate Sunday Mass in private homes for their faithful? There is still a certain degree of freedom for the “birds outside the cage.” But now things are going to change. The Vatican is coming to help the Government to push everybody into the cage. This is absolutely novel! This makes HISTORY! “To openly celebrate their faith in one community”? How wonderful! But where? In a church registered with the Patriotic Association, under the surveillance cameras, listening to a priest preaching the latest instruction from the reigning President-Emperor?! What other possibility? Surely this is not a really normal worship as in any Catholic church in the world! Fr. Heyndrickx attributes the merit of this “miracle” to the “courageous initiative of Pope Francis [obviously Pope Benedict (the confrontationist?) is not “his” Pope]. Fr. Heyndrickx is too humble. He is the one who deserves the price for this “big success.” He is now harvesting what he has sown for the last ten years, with the complicity of the Holy See, as soon as the Pope’s 2007 letter was published. His latest conquest: the Bishop of Lanzhou has been publicly installed last November. Another one, Bishop Wei Jingyi, is on the waiting list. A clarification on distinction between Reconciliation and Unification succeeded in fighting its way into the “compendium,” but only after 2 years when irreparable confusion and damage has already been caused in the Church. I am not going to point out all the absurdities in the article of Fr. Heyndrickx. I only want to remind him that his emphasis on “the Vatican knows best” goes against Pope Francis’ emphasis on the periphery. Remember also: you go often to China, but every day in Hong Kong, the reality of China comes before our eyes. You are welcome to Hong Kong to watch how they are going to celebrate the 60th anniversary of the first illegal episcopal ordination in China next month.